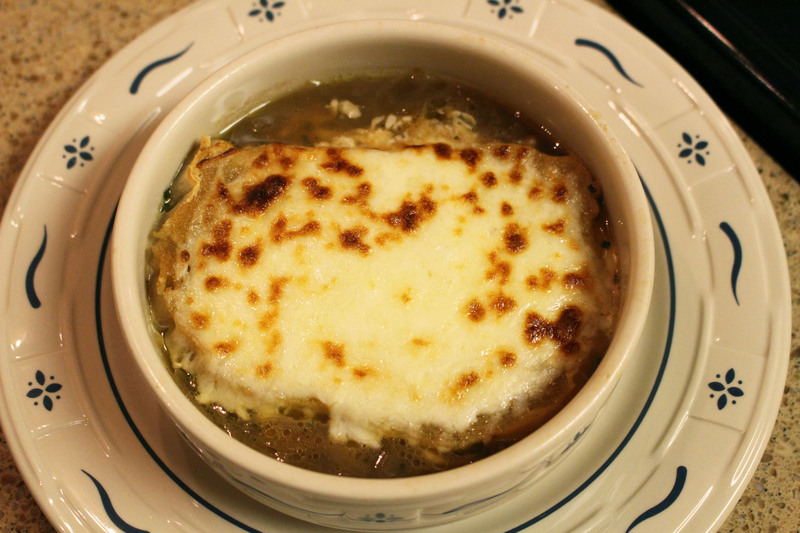 Onion soup with mozzarella cheese. Top photo has Gruyère on it.. Cheese: depending on your likes or dislikes can make or break a recipe in my opinion. For instance I do not like blue cheese or any other of the moldy varieties. Our children when they were young disliked Swiss cheese which is one of my favorite kinds. The Gruyère is my favorite cheese for this recipe as it melts perfectly and its flavor is enhanced when melted. For this recipe below, I have used mozzarella, cheddar, Monterrey Jack and the Gruyère. MIL loves stinky cheese, goat, any of the moldy cheeses as well as hard cheese varieties. DH likes pretty much every cheese except hot and spicy ones. Feel free to change-up the cheese if Gruyère isn’t to your liking. Melt butter in heavy pot (or Dutch oven) on medium heat. Remove onions from microwave with any liquid and place in pot. Add beef broth, chicken broth, soy sauce, Sherry, Worcestershire sauce. Bring to a boil and then on low heat cover and cook the soup for an hour. Butter bread, sprinkle each piece with garlic powder. Toast bread for 3-5 minutes, remove from oven. Ladle soup evenly between 8 oven-proof bowls. Add toasted bread to each bowl and top each piece with cheese. I place 4-bowls on a jelly roll pan (cookie sheet with sides) and broil 1-2 minutes or until cheese melts to golden brown or desired done-ness and repeat the process for the next 4 bowls.